With a simply elegant square neckline, this lace yoke with sleeves is decorated with a bouquet of roses and features a scooped bottom edge. 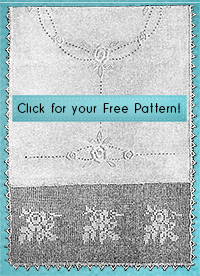 The pattern was designed in 1920 by Ida C. Farr for a girl’s yoke. You can use ﬁne crochet cotton to make it child-size, or use larger crochet thread for adult sizes. The only stitches you need to know to complete this lace are: chain stitch, single crochet, double crochet, and slip stitch.